Office 365's Exchange Online is a compelling product from Microsoft that can be integrated with your existing on-premises Exchange Server 2010 organization to extend your Exchange deployment to the cloud. In this five-part series, we'll be looking more into Microsoft's Hybrid Configuration Wizard (HCW), new in Exchange 2010 Service Pack 2 and compatible with new Wave 15 tenants in Service Pack 3, which automates the process of configuring both your existing Exchange organization and Exchange Online to interact smoothly with little impact on your end-users. A Hybrid Exchange deployment allows Office 365 to act as an extension of your existing on-premises deployment. This means users don't necessarily need to know where their mailbox is hosted, and can continue to connect to Exchange in the same way they've always done. Mail routing can flow through your existing Exchange on-premises deployment, the process to configure clients like Outlook and ActiveSync clients remains the same, and end-users use existing Outlook Web App web addresses to sign in with a browser. In addition, services like Exchange Online Archives can be deployed to allow a user's primary mailbox to be hosted on-premise, whilst the archive mailbox is located in the cloud. In part one, we're going to look at the pre-requisites required for a hybrid configuration and perform necessary checks against your Exchange deployment to help ensure a successful configuration. There are a few pre-requisites to consider before we run the Hybrid Configuration Wizard. 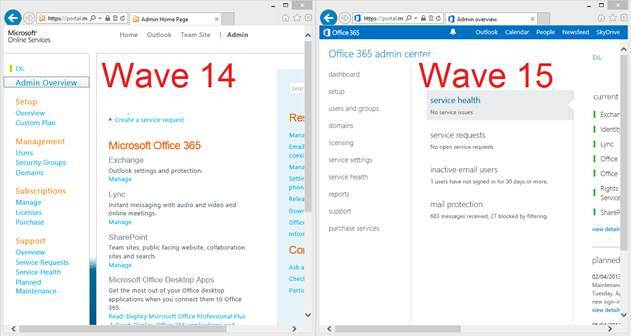 First, we'll need an Office 365 subscription, known as a tenant. If you've not got one yet, and want to try it out - I'd recommend signing up for trial of the service. Even if you've already signed up for your production tenant, you'll find a trial useful to allow you set things up in your test lab. Once we've got the tenant, you'll need to work through the basics covered in the Office 365 deployment guide, including executing the Office 365 Deployment Readiness Tool to check for any organizational issues and registering the accepted domains in Office 365 and Exchange that you're going to use for your hybrid deployment. I'd also recommend setup of Active Directory Federation Services 2.0 to provide authentication of your Office 365 mailboxes against your local Active Directory, a must for any Hybrid Deployment. You'll find guides on how to set up AD FS 2.0 within the Office 365 help and I've also written a step-by-step guide here. Finally, you'll need to setup and configure the Microsoft Online Services Directory Synchronization Tool (DirSync) so that local Active Directory accounts will be synchronized to Office 365. With your Office 365 prerequisites in place, it's time to check over your Exchange environment to verify that everything you need for the Hybrid Configuration Wizard to successfully execute is in place, and help ensure that features work after your hybrid configuration has been implemented. The first thing we need to check is connectivity to Auto Discover and Exchange Web Services from outside your organization. If you've already got external clients working correctly, there's a fair chance this is already configured, but it doesn't hurt to test. To test Auto Discover and Exchange Web Services, we'll use Microsoft's Remote Connectivity Analyzer to simulate Exchange Web Services connectivity, using AutoDiscover as part of the process. First create a test Exchange mailbox, and then run the EWS General Test (as shown below) to verify connectivity, and remediate if necessary. If you're using a reverse proxy that uses pre-authentication for your deployment, you'll also need to examine it's configuration. That's because the federated components of Exchange use token-based authentication to connect from Office 365 to your Exchange On-Premises organization rather than traditional authentication against your Active Directory, and services such as the MRS Proxy don't support SSL Offload for the EWS virtual directory. Authentication Delegation set to "No delegation, but client may authenticate directly"
Moving onto the Hub Transport components, we need to consider how Exchange will be able to route mail inbound and outbound to and from Office 365. As part of the Hybrid Configuration Wizard, a new receive connector will be created, pre-populated with the correct IP address ranges to allow mail to be received from Office 365. We'll also need to allow our Hybrid Server, or Exchange 2010 servers hosting the hub-transport role to send and receive mail to those IP address ranges at the network firewall level. The method to accomplish this varies based on your network design, but you will typically need to expose at least one Hub Transport server to the internet with a public IP address, with firewall restrictions to only allow Office 365 to communicate both to and from it on the SMTP port, TCP port 25. Additionally, we'll need to ensure the correct certificates are installed and in place for TLS-secured mail transport. When we tested EWS and AutoDiscover earlier, certificates were tested on the Client Access roles, but you'll also need to ensure that a suitable certificate is available on the Hub Transport servers if they are on different Exchange Servers; and that the certificate name is suitable. This may mean you need to ensure the Fully Qualified Domain Name (FQDN) you use for your Hub Transport roles is present on the Subject Alternative Name (SAN) certificate. If you're currently using a wildcard certificate, although it's not a best practice, this should work fine. If you're in the process of upgrading to Exchange 2010, or have only installed the Exchange 2010 Hybrid server role into your existing environment, you will also need to give your Email Address Policies (or Recipient Policies in Exchange 2003 terminology) some consideration. During the Hybrid Configuration Wizard, your Default Email Address Policy will be upgraded and then one of your Office 365 tenant domains will be added to the policy, before applying it to your Exchange organization. Therefore it's important to make sure that the Email Address policies are in good order before you begin and you should be confident that when the Hybrid Configuration Wizard applies the Default Email Address policy it will complete successfully. Next, we need to consider any network infrastructure that might prevent our Exchange 2010 Hybrid servers from communicating with Office 365 via HTTPS. The number one issue I usually see is proxy server related, so it's worth ensuring that you've tackled this up-front before you run into issues. Ensure all Exchange servers participating in the Hybrid Configuration, and installations of the Exchange Management Console you'll use to manage the environment can by-pass proxy servers for the Office 365 and Exchange Online IP addresses and URLs. If you're using a proxy server in your environment already, there's a good chance you've already performed some of this configuration, but even if you think it's right, it’s worth double checking settings before you continue. Once making sure relevant proxy settings are configured correctly, you'll need to make sure you can connect the Exchange Management Console to your Office 365 tenant. This will not only test proxy settings you've configured, but it's also necessary later on when we use the Exchange Management Console to run the Hybrid Configuration Wizard. Right click on the "Microsoft Exchange" root node, and choose "Add Exchange Forest"
Enter a friendly name, such as "Office 365"
From the drop-down, select "Exchange Online"
In part one, we've looked at the pre-flight checks we need to perform to help ensure a successful execution of the Hybrid Configuration Wizard. In the following parts of this series, we'll take a quick look at what goes on under the hood of the Hybrid Configuration Wizard itself, walk through it's execution and then finally test functionality.